Jayson Tatum scored team-high 23 points to go with six boards as he became just the 9th rookie in Celtics franchise history to score 1,000 points! 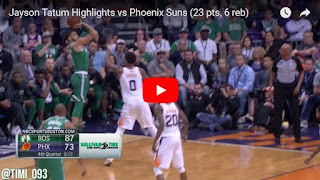 Al Horford was nearing triple-double, posting 19 points, nine boards and seven assists and the Celtics could hold off the tanking Phoenix Suns for four straight win. Marcus Morris chippped in with 20 points off the bench, returning from one-game absence due to ankle injury. Unfortunately, he re-injured the ankle at the end of 3rd quarter but he was able to leave the building on his own. Terry Rozier finished with 16 points, seven boards and three assists on the night.